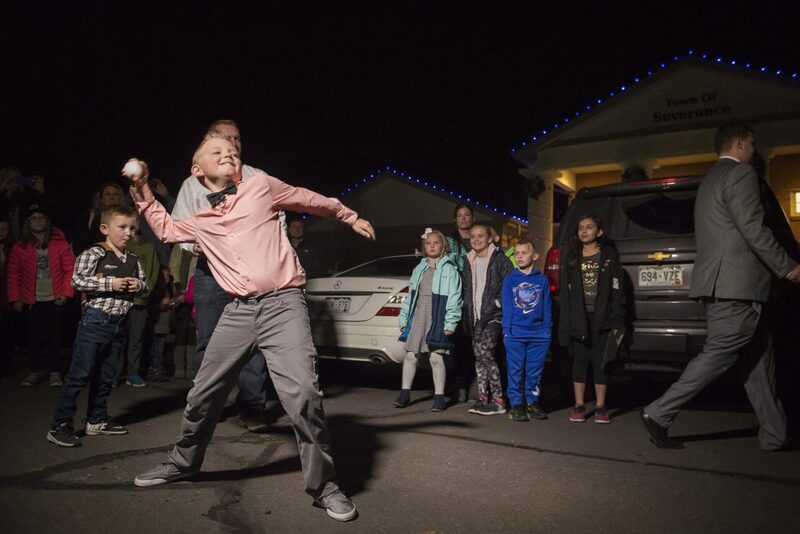 Range View Elementary School third grader Dane Best throws the first legal snowball in the parking lot of the Town Hall after presenting his argument to the town board trustees to change a law in Severance that bans snowball fights on Monday, Dec. 3, 2018, at the Town Hall in Severance, Colo. The board earlier voted unanimously to approve the law change. SEVERANCE — Dane Best, 9, took tough questions from members of the Severance Town Board on Monday night when he presented a list of reasons why they should repeal a ban on snowball fights. Severance Town Board officially made snowball fights within town limits legal after Dane asked the board to repeal the ordinance, which town officials think is as old as the town itself, founded in 1920. The rule is part of a larger ordinance that prevented people from throwing missiles or stones at people or property, and the ban wasn’t enforced in Severance. But after learning about the ordinance on a field trip this fall, Dane wanted to change it anyway. Dane’s presentation Monday was filled with an audience of children and their parents, who cheered when they heard the news. After the meeting, Dane and Dax’s grandfather, Rick Best, stood back and took in the scene as Dane and his parents took questions from reporters. He thought about how much Dane has learned about local government, and how many kids might think about getting involved themselves.